In today’s ever-changing, inter-connected world, we are seeing breakthrough innovation, creativity, and collaboration coming from the entrepreneurial community of startups. More and more larger companies are realizing how important it is to infuse that entrepreneurial mindset into the workplace, but they don’t always know how to do it. What they DO know is that they want to create a thriving culture that feels like a community and emphasizes self development; a place where executives are empowered, employees are engaged, and Millennials are activated. They want their people thinking big, creatively, and proactively. This is exactly where FreshBiz fits in! The one thing every business can count on is accelerating change. That means people need to work together in new ways. Change is hard. And that probably means you’re seeing more frustration, confusion and breakdowns. To win this continually evolving game, businesses need their people to think proactively and work collaboratively. To do this well, people need development.They need to up-level their game. Game-based learning is the ideal tool for doing that and keeping pace with the changes happening around us. FreshBiz: Game-based learning that produces instant mindset and behavior change. FreshBiz is a unique learning experience that gets people at all levels of the business discovering, practicing and embodying creative new methods of entrepreneurial thinking. After just one 3-hour working session, every team member will come away with powerful and lasting insights that improve teamwork, problem solving, opportunity-spotting, resource optimization and much more. Plus, they’ll have fun, get to know each other better and build stronger relationships as they play. FreshBiz is a GAMECHANGERS 500 company. FRESHBIZ IS FRESH TO THE US. ThinkBusinessGrowth is proud to be among the first consulting firms in the U.S. and the first on the West Coast to facilitate FreshBiz experiences for our clients. 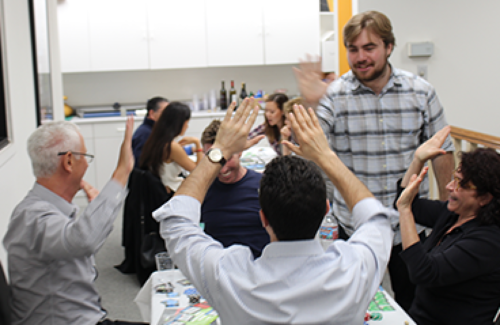 WHAT HAPPENS AT A FRESHBIZ WORKSHOP? Our basic training is the 3 hour game-based workshop which lets participants really develop their entrepreneurial muscles. 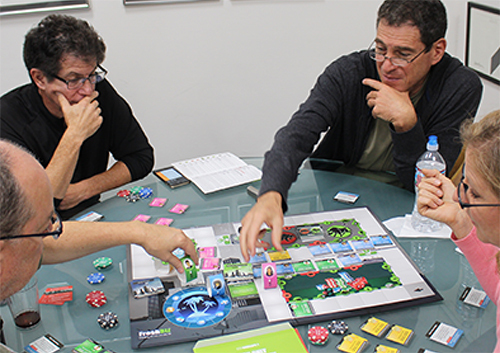 After a 20 minute intro with game instructions, participants “head out” on a 90 minute immersive adventure of playing the FreshBiz board game. The goal is for them to win the game, and to do so, they’ll need to collaborate, come up with creative ideas and solutions, spot opportunities, smartly manage their resources, and make things happen. Each player goes through their own intimate personal process on how they play life and business, while the facilitators in the room support the game play and collect notes they will use later for the debriefing. Before the end of the game, the facilitators get more involved in presenting creative solutions and possible insights through coaching. This gives participants a chance to try new things and shift their strategies, in addition to giving them valuable new insights. For sure, the most powerful part of the workshop is the last hour. This is the debriefing and wrap-up, and of course it takes place once the game time is up. For the first 15 minutes, participants get to share their insights from the game; what they learned about themselves and the world of business. AHA moments include participants realizing that they could have played collaboratively rather than automatically playing competitively because of old habits, beliefs, and ego or participants finding themselves stuck in the game because they were blind to the all their non-monetary resources…until a trainer showed them what’s possible. The workshop concludes with taking a deeper look at the game dimensions and how they specifically relate to life and business, breaking down old beliefs and ideas, and then presenting new game-changing ways to think and act in business. Now the business mechanics and entrepreneurial thinking have been gamified, participants are now unlocked and unleashed in their thinking about what’s possible for them. communicate, and act. So let’s play! Get inspired to succeed! Join my mailing list.